The first scenario in an eight-part chronicle which will be released here on DriveThruRPG. The chronicle takes the characters deep into the World of Darkness, revealing some of the secrets of the Awakened. 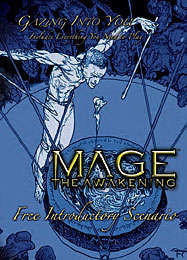 Download this free booklet for everything you and five of your friends need to play your first game of Mage: The Awakening, White Wolf's all-new Storytelling Game of Modern Sorcery. Discover the hidden and mysterious world of the Awakened. This title was added to our catalog on July 08, 2005.